Earlier this year, I was assigned a very large task by top luxury lifestyle publication Elite Traveler Magazine. I am proud to say that I have been covering watches for the publication for several years now, and we regularly take close-up looks at timepieces that are influencers in today’s world, and why. However, the assignment I agreed to take on was much bigger in scope than usual: The Top 50 Watches of 2017. I am thrilled to say that the mega-project, The Top 50 Watches of 2017, has now been published and is out in print and online. 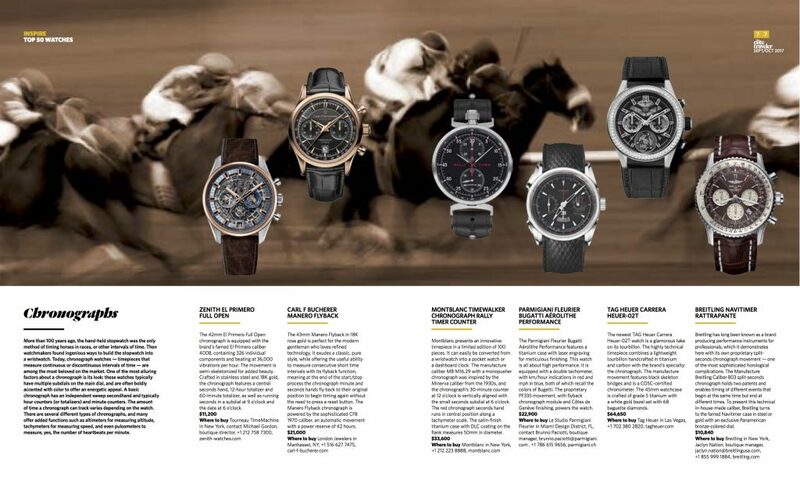 Here we bring you a look at the selection process and the categories, as well as some of the top watches. 3) All watches must retail for more than $10,000. 4) No watch brands should be repeated, in an effort to give readers the broadest scope of the market under such tight constraints. 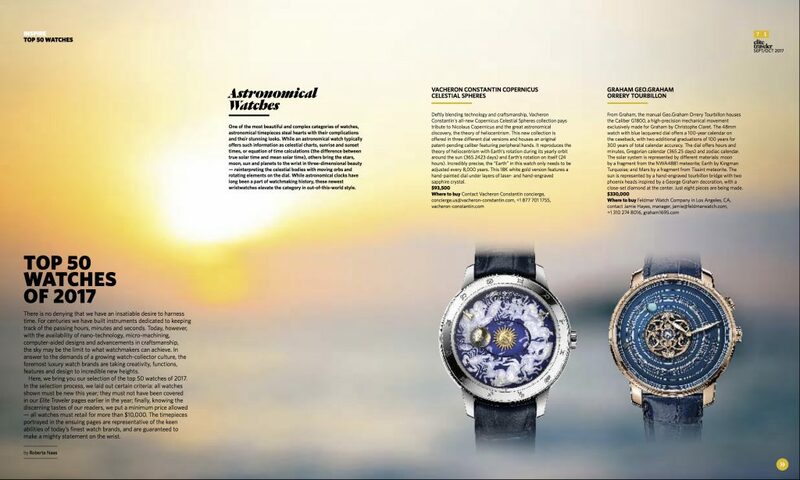 Over the course of several months, watches were selected in each of the nine different categories: Astronomical watches, Chronographs, Calendars, Complications, Innovations, High-jeweled, Métiers d’ Arts, Skeletons and Sport watches. All watch brands named in The Top 50 Watches of 2017 receive a certificate of inclusion and watch brand executives, as well as collectors, are invited to a grand Cover Party event being held at Wempe Jewelers in New York. 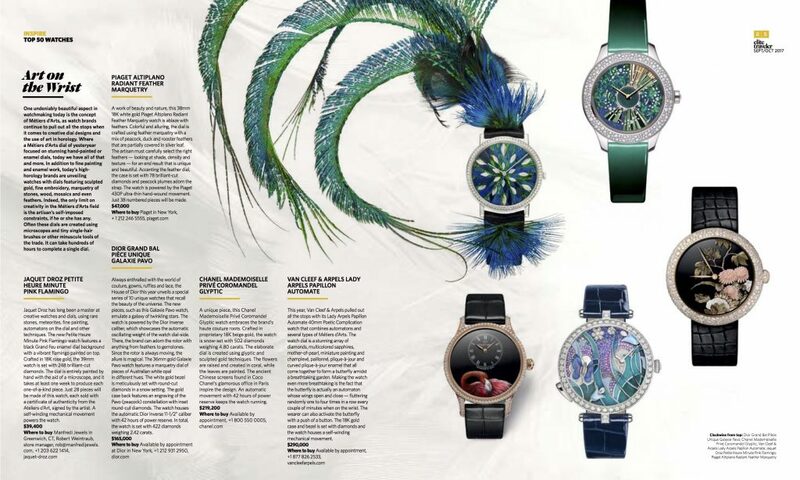 As the article says, “The timepieces portrayed … are representative of the keen abilities of today’s finest watch brands, and are guaranteed to make a mighty statement on the wrist.” Here we bring you a look at highlights from the 18-page special section in Elite Traveler Magazine. For the full story and all 50 picks, visit Elite Traveler Magazine.